A new class of Miami-Dade County Schools Police was sworn in on Tuesday morning at the district headquarters in downtown Miami. The newest Miami-Dade school resource officers includes a veteran art teacher who decided to change careers and a couple of retired police from the city of Hialeah. 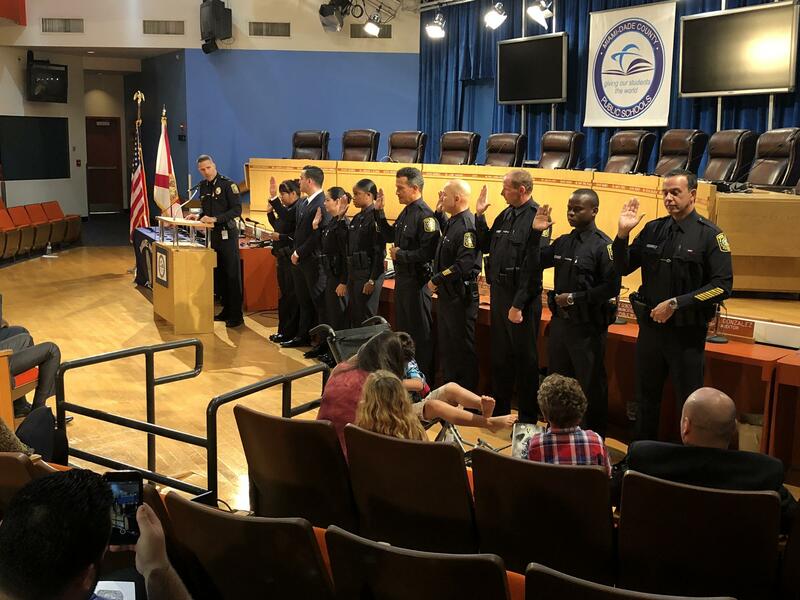 The class is the first to be sworn in since the state Legislature passed a new law requiring a cop on every campus, as a result of the shooting at Marjory Stoneman Douglas High School. They include a veteran art teacher who decided to protect classrooms, a former undercover narcotics detective who came out of retirement, and an early-career cop who wanted to help after the shooting that left 17 dead at Marjory Stoneman Douglas High School. 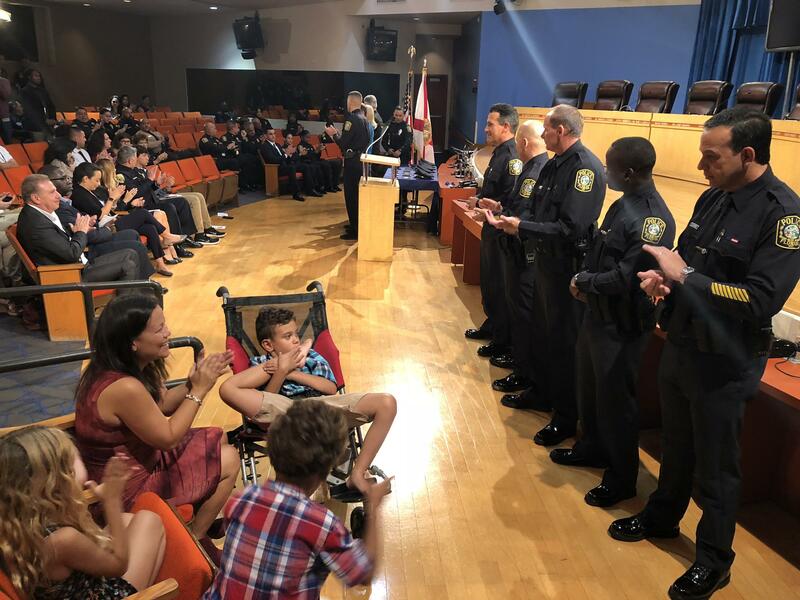 Miami-Dade County Public Schools Police Department swore in seven new school resource officers on Tuesday, the first class of new cops welcomed to the force since the February massacre in nearby Broward County. The additional officers will help meet the new state requirement that a cop or armed guard be stationed on every campus when school starts again in August. 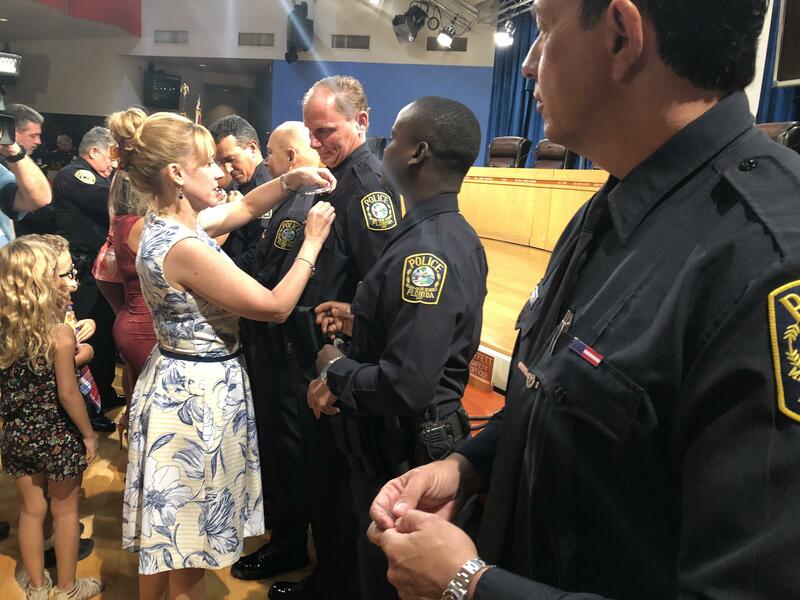 During the swearing-in ceremony on Tuesday, Superintendent Alberto Carvalho again pledged that the district would comply with the law without putting guns in the hands of anybody who’s not a trained law enforcement officer. Broward school district leaders have said the move is necessary to comply with the law. 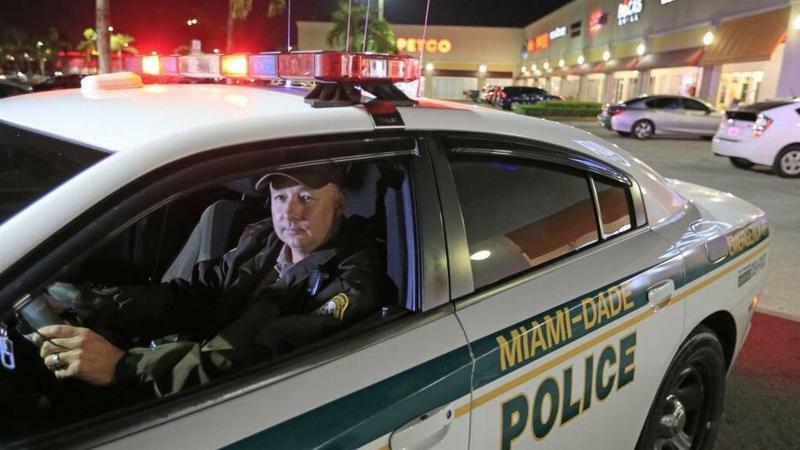 The district doesn’t have the money to hire enough officers and even if it did, there’s a shortage of available law enforcement in South Florida. Miami-Dade plans to overcome the same challenges by partnering — and sharing the costs — with local police agencies. The Miami-Dade district is also asking retired police officers to come back to work. Manny Alvarez, 50, and William Carter, 46, both retired from the City of Hialeah police department. They were sworn in Tuesday. Ariel Nuñez, 27, left that department to work for the school district instead, citing the shooting as his motivation. Officer Freddie Rosa, 49, is a former Marine and has been a teacher since 2001, starting in Puerto Rico. He came to Miami-Dade several years later and has taught visual art at Avocado Elementary School in Homestead for the past two years. After the shooting, he decided to change careers. “After those unfortunate events that happened … I really felt the call in my heart to do more, to protect the children beyond the classroom setting,” said Rosa, who has three children of his own. Also at the ceremony, Sofia Shakir, 42, was promoted to sergeant — and she’s the force’s first Pakistani woman in the role. A single mother of two, Shakir speaks seven languages and decided to become a school resource officer initially because she wanted to build bridges between Muslim students and their peers. She said the promotion raises the stakes. Miami Herald reporter Colleen Wright contributed to this story. 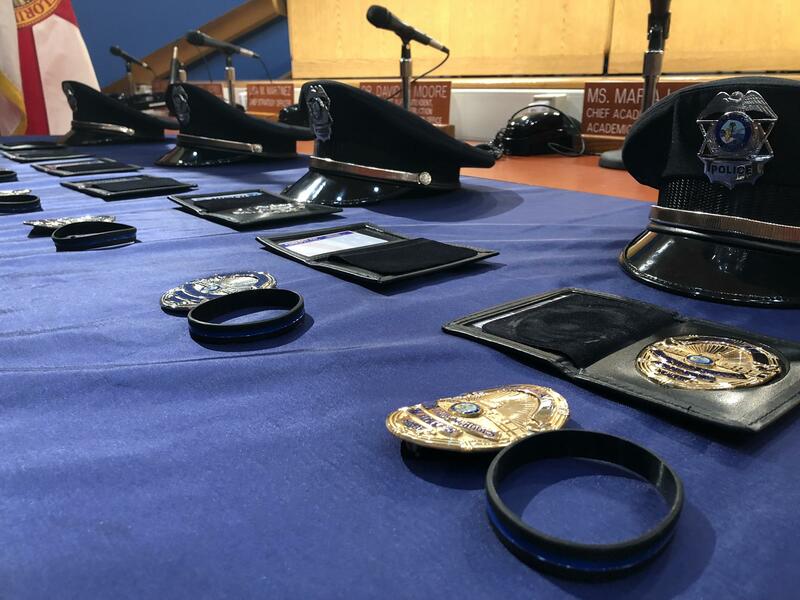 At a ceremony on Tuesday, seven new officers were sworn in and one was promoted to sergeant. Three South Florida school districts earned “A” grades for the academic year that just ended. 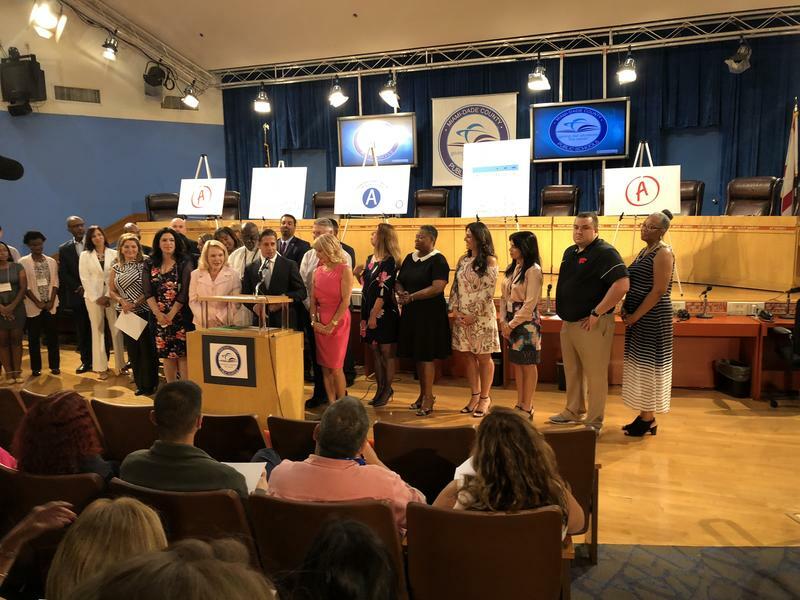 The Miami-Dade, Palm Beach and Monroe county school districts all saw their grades increase from “B” to “A” for 2017-18. Broward County Public Schools kept its “B” from previous years. The Florida Department of Education released the newest ratings on Wednesday.